Sadly for my Consultant this morning: it was him. Ehh. It didn’t go well. In fact, it damn nearly didn’t go at all. 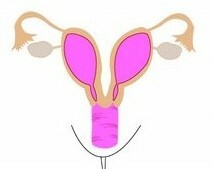 Let me remind you, firstly, of my uterus didelphys anatomical layout. to a giant, baby-dilated cyclops that renders all other cervi effectively invisible. Cyclops-cervix belongs – of course – to my right-hand, Harry-housed uterus, i.e., the one we have spent thousands of pounds on IVF to avoid conceiving in. Although my consultant said she found the small one ok when I was under sedation for my lap, my local practice nurse certainly can’t see it anymore, and neither can my GP. Today: my altered topography caused horrendous problems. It started off well: I breathed a huge sigh of relief when I spotted the Consultant on duty; I had been terribly anxious that I’d encounter a rookie, but I recognised one of the very senior chaps and relaxed immediately. There was also good news about my blastocysts – 2 of them were simply surging ahead, and measuring 2CC and 1CC respectively – although the embryologist hastened to assure me that the ‘CC’ was merely because they were still forming, and by the time they actually got around to replacing 2CC – hours later – it had moved on nicely to become, and I quote, ‘beautiful’. I was also insufferably smug to learn – with the best will in the world, curtains are impossible not to overhear through – that, of all the Monday retrievals, I had the most advanced blastocysts in the ward; everyone else had piddly compaction-or-cavitating ones. I have, until now, had zero opportunity to put on dog regarding any kind of reproductive triumph, so I lay back on the bed and basked in my petri-dish prowess. Even with a good team, it was still bloody awful. Speculum after swab after probe after catheter. The consultant, a sincerely delightful and lovely man, was profusely apologetic for the ordeal-by-FordCortina-sized-speculum he was putting me through. He scurried out of the theatre twice to obtain obscure gynae instruments. I was tilted head-down at an angle which kicked off acute oesophageal acid indigestion to add to my woes. Embryo transfer generally takes a little upwards of 10 minutes; at the end of an hour I was still there, tipped-up, strapped in, occupied, covered in ultrasound gel, and endeavouring to sustain small talk with the nurse and embryologist, who had taken up station on either side and were making profoundly sympathetic and encouraging noises to me. I could feel he was being careful – I have encountered more speculum drivers than most – but after an hour, my insides felt pretty damn punished. I was agitatedly aware that Harry, currently being fed a slap-up fried breakfast in the hospital canteen – alright for some – was becoming absurdly late for his very-time-dependent Grandparent playdate. I was sinkingly aware that the nursing staff had expected to have everyone blast-transferred and departed by 10am, and it was now well gone 11am. I was inescapably aware that my insides were Presenting A Big Problem. Stress City. Eventually, Consultant called time for tea and biscuits bladder relief, as he was horribly conscious that I’d been keen to go before I went in. He assisted me off the contraption they term a ‘bed’, explained again the difficulties he was having, and that we’d have a short break for a re-think – but that general sedation was looking a likely option. I had no idea quite when he was thinking of knocking me out, but I was fairly certain he didn’t have a tame anaesthetist in his back pocket on Saturday morning, and Monday morning would be Day 7. All sorts could happen by Day 7. I trudged off despondently for a painful pee ‘don’t worry if there’s a little bit of blood!’ and sat there, groaning gently. Just my luck. A great blastocyst, but no way to get the bugger back in. 5 minutes later, we all trooped back in for another go. My stoicism and endurance were praised (although I’m always sadly suspicious of that sort of compliment. What else are they supposed to say: For the love o’God woman, will you not stop flinching and ouching? Do you WANT this bloody baby or not?) and I was strapped back in. Tipped up even further. More lights. More equipment. More, I sincerely hope, overtime pay for the 3 poor souls who were spending a glorious Saturday morning struggling with my recalcitrant goddamn cervix. Eventually – about 90 minutes after I’d first walked in – there was progress. A dummy catheter had already been inserted through Cyclops to clearly mark it as out of the running, and now a second catheter had been successfully passed into a second cervical os. This os was apparently discovered partially within the outer circle of Cyclops and initially looked unlikely, as the two catheters seemed to run too closely side by side – but then the new catheter took a sharp turn to the right. The ultrasound must then have picked it up in the correct place, as there was suddenly a palpable carnival atmosphere, and the embryologist scurried off to fetch 2cc – which we have, of course, christened Turbo. Turbo then managed to get retained in the catheter first time around (John later attributed this to its rapidly-increasingly girth) and needed another rinse through before taking up – I pray – residence in the correct place, at the correct time. I was finally ushered back to bed by my mightily relieved Consultant – he even dived for my slippers, replaced them on my feet, bounded up to Harry – tummy down on my bed, waving his feet in the air, watching his iPod – shook his hand, asked him all about his shark t-shirt, and took our drinks order. Kind Nurse ate even further into her unexpectedly-extended working morning by bringing said drinks, and letting Harry choose 3 whole packets of NHS biscuits. He liked her. Embryologist came to say goodbye and good luck; we’ll hear from her again Monday. When the NHS gets it right, it really does get it right. I feel a thank-you card coming on – probably with a picture of John Wayne on the front, as that’s who I left the unit walking like. Dear Embryo – well done, you’ve instigated what is very hopefully a lifetime of causing your mum momentary discomfort, and she has now the perfect armory of “guess what I went through for YOU, youngster!” anecdotes. I’d do that sticky-baby-fairy-dust thing, but that makes seasoned vets (like us) want to punch people. Instead I will stand here with my hands on my fists and ORDER Turbo to get a move on. That oughta’ help. Wow! What an ordeal! Glad it ended successfully. Go the insertion team! And good luck for the next phase. Dear Turbo, please stay long enough to rearrange your mother’s insides back into domino formation when you leave, to match your brother’s exiting havoc. Love, internet auntie May. Ha, awesome:) Keep on turboising, Turbo. Turbo – do your thang! And HFF – the end of that story fair brought a tear to my eye. I’m guessing the middle, speculum-bearing but of it probably made your eyes water a little more, mind. I bet you were pleased it was the weekend and you weren’t subjected to a band of students being shown your internal unusualness! Anyway Turbo get going with the things you are supposed to be doing!! And no slacking. Turbo, love it. Lets hope the new gait helps implantation! So glad you had the senior people and familiar faces there, what a story! Keeping everything crossed for you, as you wait. To be blunt, after all that effort, little Turbo had better bloody well stay there until he’s big enough to change his own nappies. Okay, maybe not quite that long – but an absolute minimum of 38 weeks!! Keeping everything crossed for you as is half the internet. Grab on, Turbo! Grab on! And kindly stay put for the next 36-40 weeks. Glad you got through transferal okay, Ann. You, your doctors and nurses all come out of this sounding like rocks stars. Oh! What a cliffhanger. Now I cross my fingers, this being the only thing I can do, and think sticky thoughts. That was epic. But a happy walking off into the sunset ending. Good luck. Good luck. Good luck. Goodness, that sounds… traumatic! I feel I should send you some sort of ice pack to sit on! You’re a braver woman than me, that’s for sure. I think I would have started screaming after oh, approximately 10 minutes. C’mon, Turbo! Make us all proud! OH LORD!!! You are a far, far braver woman than I. Little Turbo, do your stickiest sticking! That’s one fabulous mama you have awaiting you! Eek. I started off reading this in a fairly relaxed position and ended up reading it wincing with sympathy and with my legs twisted together like liquorice sticks. Blimey woman, you are determined. I am keeping everything (including my legs) crossed that all goes well with turbo. Go turbo go. Or rather stay turbo stay!!! Oh god …. You know what I mean don’t you! Have everything crossed …. I believe that Turbo witnessed this whole thing and realizes how much you want him/her. Hopefully that is enough to convince him/her to stay around!